Do you want your projects to be more organised? Do you have problems juggling around multiple projects at once? Do you need help with deadlines and milestones? Do you need a way of illustrating groups of milestones and scheduling time? Project and Scheduling is very important when any business undertakes a task. Whether you are a small business, a large organisation or anything in between, organised projects are key to success, increased business and more accurate on-time deliveries! Good project scheduling software will help you allocate the exact amount of work to your employees and enable you to manage each event or milestone effectively. Project and Scheduling Software is essential for companies who want to effectively manage multiple projects at the same time. Project and Scheduling Software can help manage resources and allocate them to the places they are needed as well as tracking what needs doing and by when. Excellent Project and Scheduling Software will guarantee an increased profit due to on time deliveries and more efficient resource management. Scheduling a project well is important as it enables you to be more conservative of your resources. 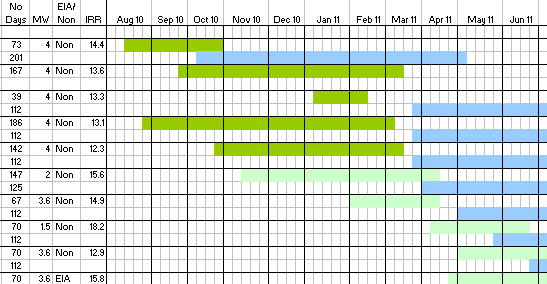 A project management chart, also referred to as a Gantt chart, which can be used to efficiently schedule important events and manage your projects.